Notes: The work above represents a sample of assets I produced for Forza Motorsport 3 for the XBox 360. 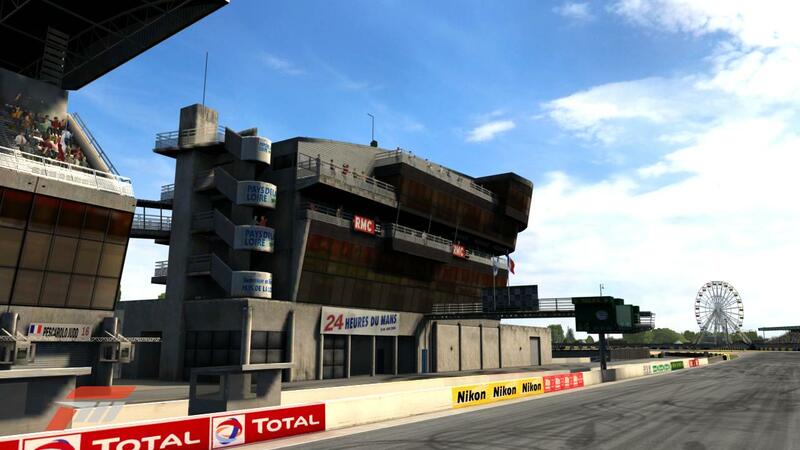 I was employed as a track artist and my primary responsibility was the real-world Circuit de La Sarthe in Le Mans, France - home of the famous "24 Heures du Mans" endurance race. My work on this project included doing track research to prepare asset lists for external vendors, modeling and texturing track assets, writing Maxscripts for production artists to automate routine tasks, and programming new HLSL shaders in conjunction with lead artists to develop a track's visual style and add new visual effects. Below is a brief summary of the work in each image, from right to left, starting from the top row. 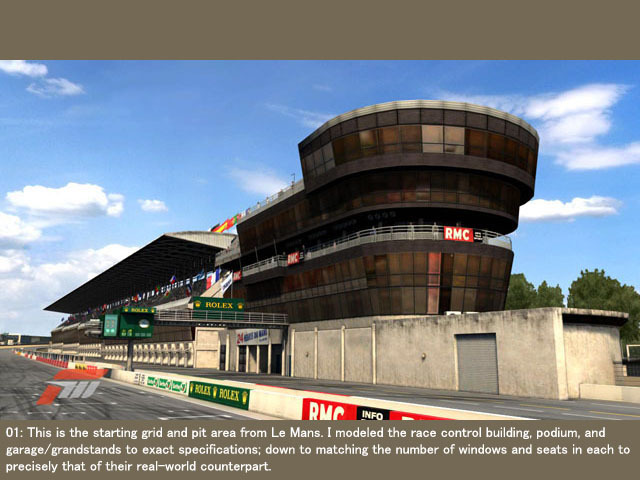 01: This is the starting grid and pit area from Le Mans. 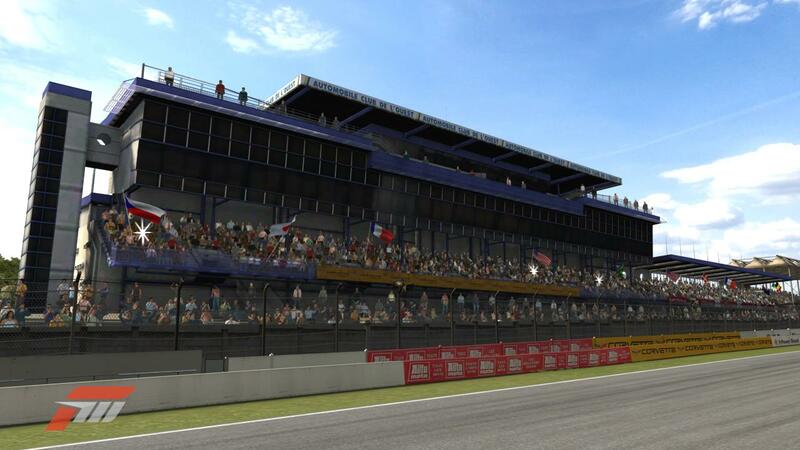 I modeled the race control building, podium, and garage/grandstands to exact specifications; down to matching the number of windows and seats in each to precisely that of their real-world counterpart. 02: This weathered road surface was developed in conjunction with this track's lead artist in order to match the assets to the original concept art. I designed a bump-mapped shader blending multiple textures in order to create a tileable, worn road edge. This effect was implemented on the Camino Viejo circuit. 03: These animated flags are using a procedural vertex animation I implemented in HLSL. They include a gust and doldrum cycle in order to create a large variety in their motion. 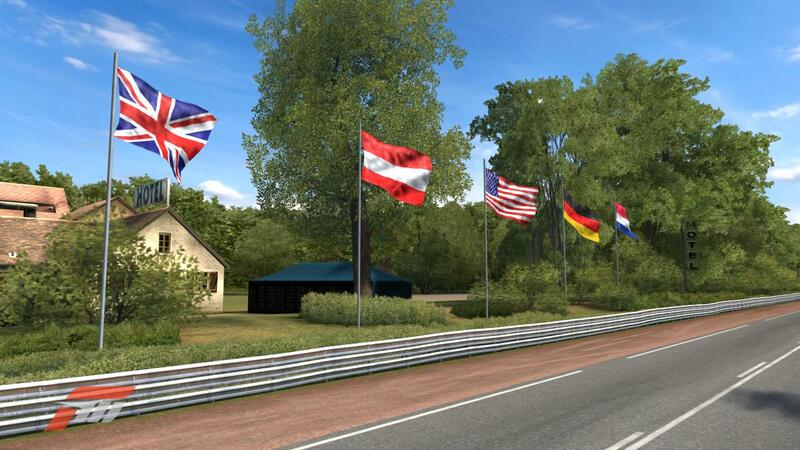 These flags are found scattered throughout all the tracks in Forza 3; this particular shot is from Le Mans. 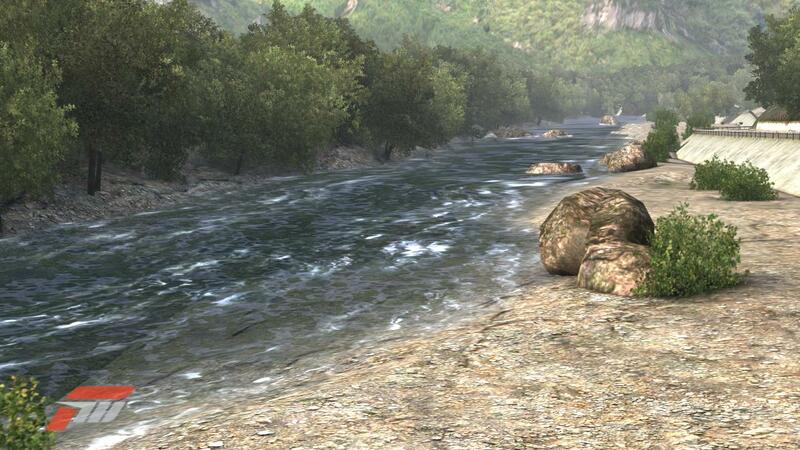 04: This animated river on Fujimi Kaido was the result of a shader I developed in conjunction with work from Valkyrie Entertainment. 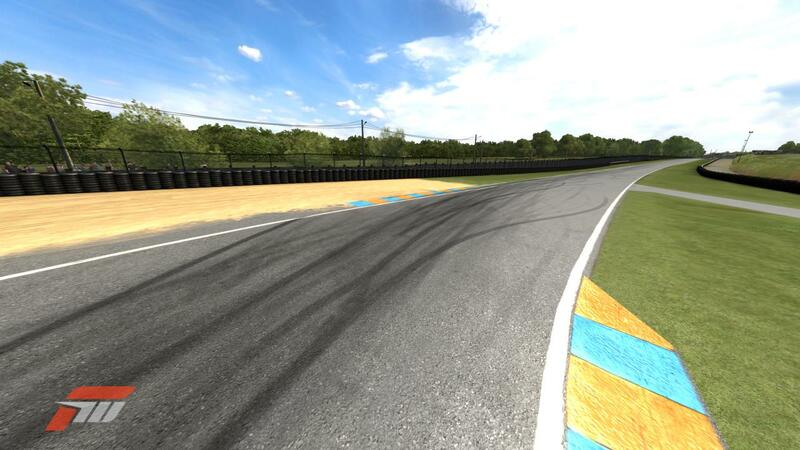 05: This turn on the Bugatti Circuit in Le Mans features skid marks I painted in conjunction with Glass Egg Digital Media. 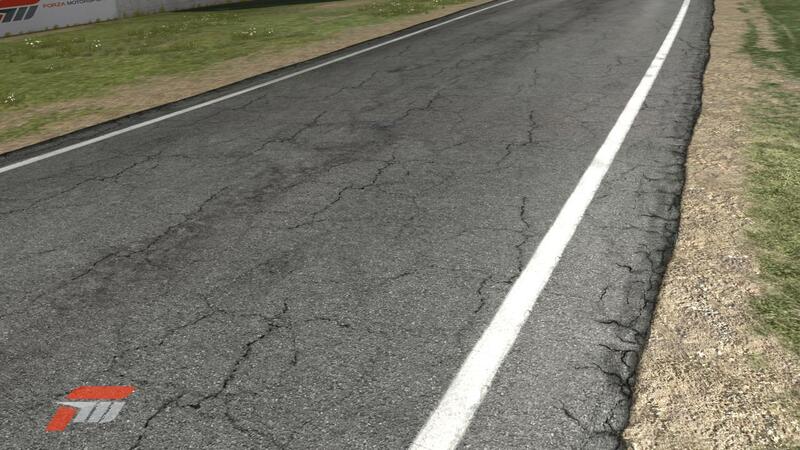 These road skids are crucial for both providing the player in-environment clues as to how to drive the track (by highlighting the ideal racing line) as well as creating a visual narrative of crashes, spins, and burnouts that have taken place previously. Knowledge of racing technique and tire physics were an important part of this task. I was responsible for painting road skids for the entire Bugatti circuit, as well as parts of the larger Circuit de la Sarthe; both part of the Le Mans environment. 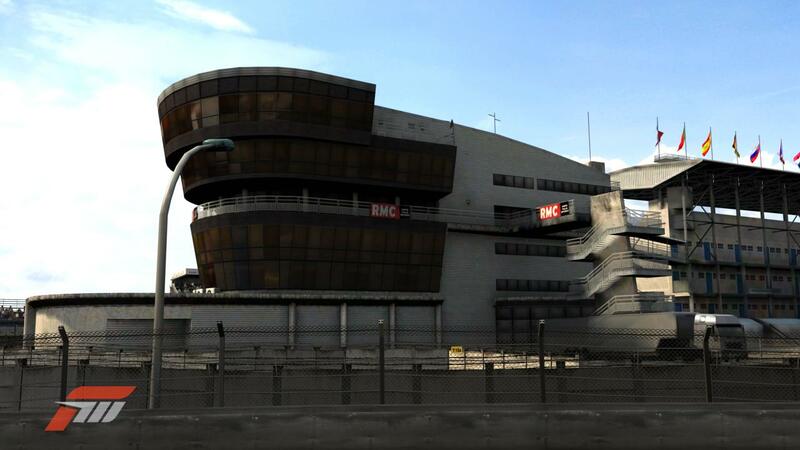 06: Another shot of the Le Mans race control building and the adjoining garage/grandstands. Flags from many nations are waving along the roof of the grandstands. 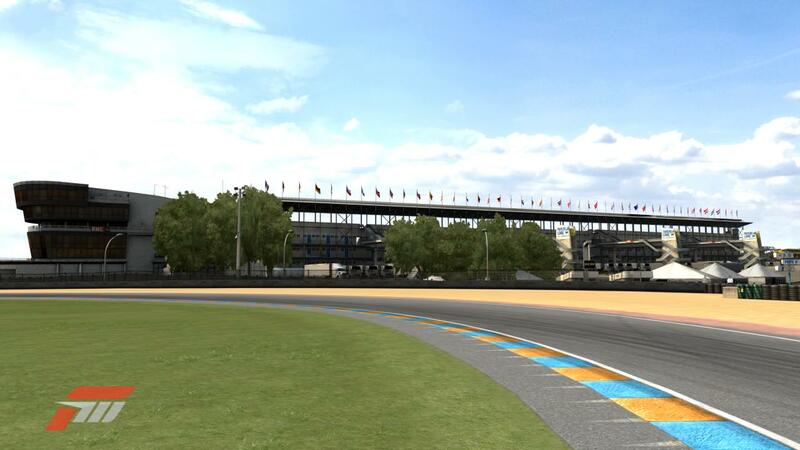 07: This rear shot of the race control building also shows the Le Mans ferris wheel, which I animated using trigonemtric math via a vertex shader. You can also see the first garage in the garage building - I carefully reasearched the real building and replicated the order and labeling of the team placards the exact way they appeared for the race in 2006. 08: This shot shows the full length of the garage/grandstands, as well as the detail in the bridges and staircases used by patrons to access the outfield venues. The flags on top of the building can be seen in various states of waving. 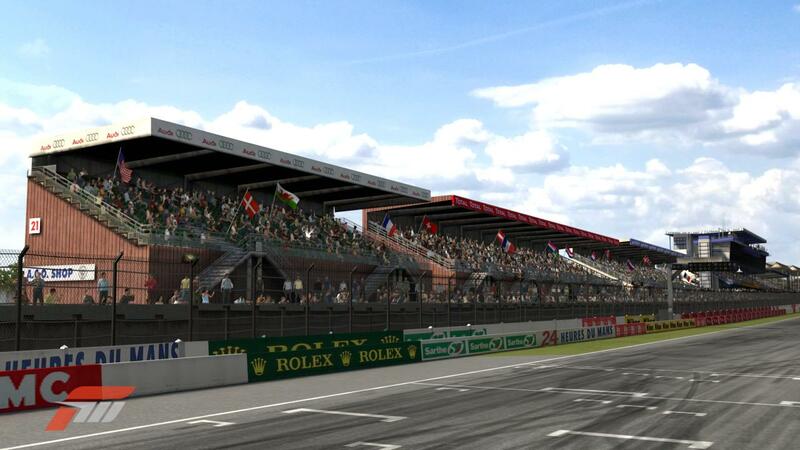 09: All the grandstands in this shot were modeled and textured by myself to precisely match the measurements and seat count of the real thing. Also visible here is a secondary type of flag - this shader shows the flag being swung from side to side, as opposed to flapping on a free-standing pole. 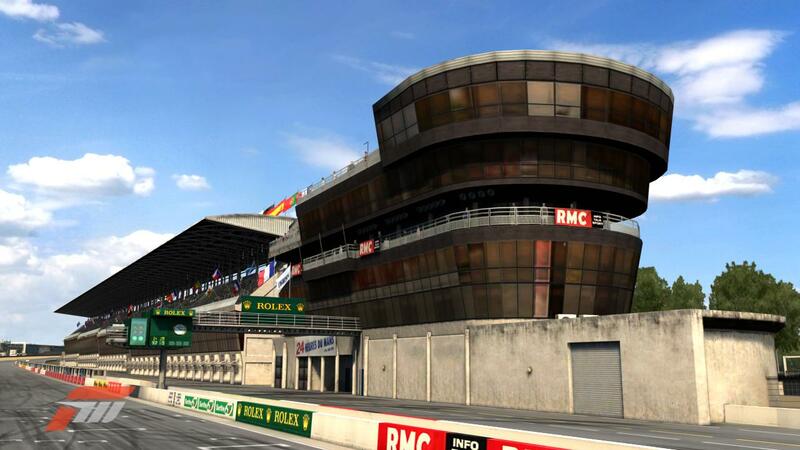 10: I modeled this large grandstand (which is also visible in the 1971 Steve McQueen Movie, Le Mans.) This shot also shows a camera flash shader I developed, featuring a vertex shader driven camera facing sprite and a single-frame sprite animated through a pixel shader levels adjustment.